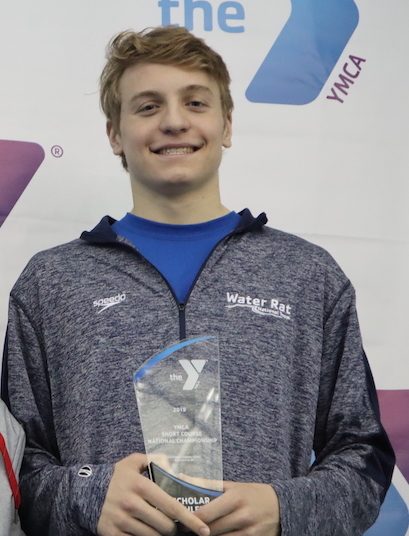 Congratulations to Alec Keblish for receiving the 2019 Adolph Keifer YMCA Youth Character Award at YMCA Short Course Nationals last week. Alec received this award for his efforts both in and out of the pool. The Adolph Keifer award “recognizes one male and one female for their excellence in academic achievement, demonstration of the YMCA core values, and commitment to strengthening their community in the YMCA competitive swimming program.” The recipients must maintain a GPA of 3.5 or higher during their senior year of high school, have volunteer experience with community organizations, participate in YMCA Short Course Nationals, and plan to continue their education beyond high school. The selected applicants receive a $2500 scholarship to be issued to the college or university they will be attending next year. This award is a great honor and the coaching staff and team are so proud of Alec for this accomplishment.